Gasteria nitida (Salm-Dyck) Haw. var. armstrongii (Schönland) Van Jaarsv. A highly localized species (EOO 9 km²), known from a single, small population of about 500 plants, which is likely to decline by more than 80% within three generations if planned coastal development is to go ahead. Gamtoos Valley near Jeffreys Bay. 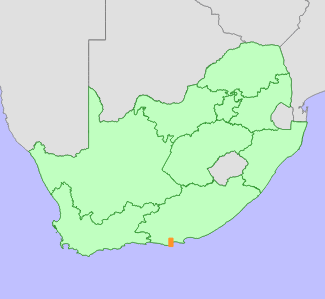 At least 40% of this species' habitat has already been lost to agricultural expansion, and the population remains on a single, fairly extensive fragment of remaining coastal renosterveld. The population continues to decline due to ongoing habitat degradation due to quarrying, dumping, and spreading alien invasive plants. The site has been earmarked for coastal development, which is likely to have a severe impact on the population. Succulent collecting is also an ongoing threat. 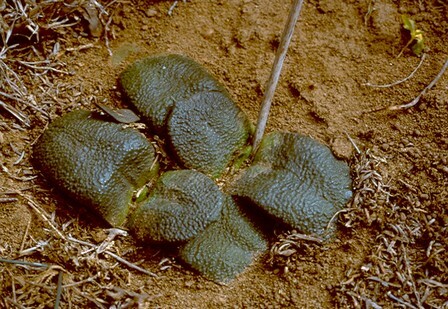 Gasteria armstrongii occurs in scattered, small clumps across a ±8 km² stretch of coastal renosterveld, spanning a number of properties. Surveys of the area over the past 10 years estimate the total population size to be around 500 mature individuals, which are all likely to be part of a single subpopulation, as habitat is still largely continuous over this area. The population is estimated to have already declined by at least 30%, predominantly due to habitat loss to agricultural expansion. If proposed coastal development plans are to go ahead, this species could decline by up to 80% in the next 20-40 years (1-2 generations). Van Jaarsveld, E. 1992. The genus Gasteria, a synoptic review. Aloe 29(1):1-32.